It's a crying shame how poorly we treat product directors on Agile projects. They're tossed into the hardest job on the team with no training, no support, and no one to talk to. Something Must Be Done. I would like to have two peer workshops this year. The main purpose is to let product directors get together and teach each other. A secondary purpose is to have a mix of product directors, testers, programmers, and so on teaching other. Since I will be in London anyway for Software Practice Advancement 2007, I'm thinking that would be a good place to have one, and March 30 - April 1 would be a good time to have it (possibly shifting it a day or shortening it a day). The format I'm thinking of would follow the AWTA variant of the LAWST workshops. The format is one mainly of people telling their stories to the group, who respond by asking lots of questions. There's no time limit on a presentation, so the question-and-answer period can really probe into what happened and what conclusions can be drawn. There may also be open space style breakout sessions and lightning talks. What I need is a local organizer. Up for it? Mail me. I'm also thinking of having one in North America. Possibly in Chicago, Calgary, Toronto, Denver, or somewhere else. 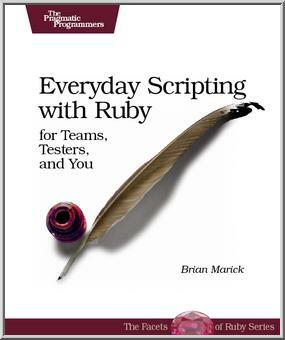 Everyday Scripting with Ruby is out. We're pleased to announce that Brian Marick's new book, "Everyday Scripting in Ruby" is now available. For details, please visit http://pragmaticprogrammer.com/titles/bmsft. Are you a tester who spends more time manually creating complex test data than using it? A business analyst who seemingly went to college all those years so you can spend your days copying data from reports into spreadsheets? A programmer who can't finish each day's task without having to scan through version control system output, looking for the file you want? If so, you're wasting that computer on your desk. Offload the drudgery to where it belongs, and free yourself to do what you should be doing: thinking. All you need is a scripting language (free! ), this book (cheap! ), and the dedication to work through the examples and exercises. I consult mainly on Agile software development, with a special focus on how testing fits in. A roadmap for testing on an agile project: When consulting on testing in Agile projects, I like to call this plan "what I'm biased toward." Tacit knowledge: Experts often have no theory of their work. They simply perform skillfully. Process and personality: Every article on methodology implicitly begins "Let's talk about me."